View of the Shirawati river, Garsoppa, with encampment, a sepoy standing guard. April 1806. The finished version of WD850. bl.uk > Online Gallery Home	> Online exhibitions	> Asia, Pacific and Africa Collections	> View of the Shirawati river, Garsoppa, with encampment, a sepoy standing guard. April 1806. The finished version of WD850. 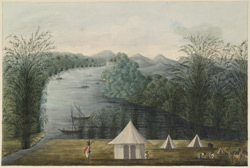 Water-colour painting of a camp by a river with a sepoy standing guard by an unknown artist in 1806. Compare WD850, the preparatory drawing, which identifies the scene as a view of the Shirawati river, Garsoppa, April 1806. The Sharawati River runs through the Western Ghats before plunging spectacularly in four cascades, the highest of which (Gersoppa Falls) is c.830 ft (250 m). Gersoppa is an ancient town, the chiefship of which seems very often to have been held by women as almost all the writers of the 16th and early part of the 17th century refer to the Queen of Gersoppa. In the early 17th century the dynasty ended when Bhaira Devi of Gersoppa was attacked and defeated by Venkatappa Naik, the chief of Bednur. In 1623 the Italian traveller Della Valle describes the place as a once famous city, the seat of a queen and the metropolis of a province. The region was so famous for its pepper that the Portuguese called the Queen of Gersoppa Rainha da Pimenta of the Pepper-Queen.